200 Freestyle: Sprint or Distance? If you’re aware of my series on the analyzing how the elite swim the 200s, you’ll know that I’ve collected a lot of data on elite swimmers. So it seemed natural for me to use this data to answer (at least to myself) an age-old question. 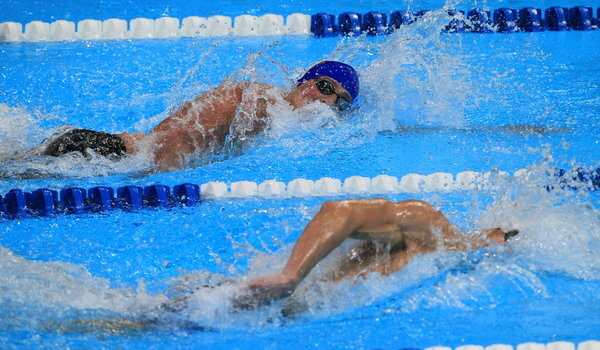 Is the 200 Freestyle more sprint-oriented or more distance-oriented? We know it has both elements in it, but which one dominates? The data set consists of 24 women and 24 men elite swimmers at the time of the 2012 Olympics. I used the fastest 24 200 Freestyle times from the Olympics and the US Olympic Trials. For each selected swimmer, I used the fastest time they swam during the competition, and not just their last swim. As part of this analysis, I collected each of the 50, 100 and 400 metre Personal Bests [PBs]. (In this and all previous analyses, I disregarded all swims during 2008-2009, as the data clearly shows that shiny suits distorted all swimming times. I’ve also found that it is incredibly interesting and useful to also look at 50 splits when compared to that swimmer’s 50 PB. It makes the data applicable to a much wider range of swimming speeds than raw splits would allow. So, “Offset” is a split minus that swimmer’s PB for that distance. There were a few swimmers for whom I could not find a 50 or 400 PB, or at least couldn’t find a realistic one. See NOTES at the end of this post for an explanation of how I handled it. The first part of the analysis is fairly straightforward. We start with the idea that sprinters and distance swimmers will swim the 200 Freestyle differently, and then we’ll test that. We group the 24 swimmers into 3 groups of 8 based on different characteristics. For our purposes here, we’ll group them according to their 50 PBs, then again according to their 100 PBs, and finally according to their 400 PBs. As an example, when we group by 50 PBs, the Top 50 PB Group has the 8 fastest 50 PB swimmers, the Middle Group has the next fastest 8, and the Bottom group has the 8 slowest 50 PB swimmers. We are really just interested in the 50 PB (representing sprinters) and 400 PB data (representing distance swimmers), but we’re including the 100 PB data to see if these swimmers are effectively a hybrid of the other two. The charts below show the average 50 splits and average 50 offsets for the Top 50 PB Group, the Top 100 PB Group and the Top 400 PB Group according to their raw 50 split times, and their 50 offsets. Basically the three curves represent the average swims for the fastest 50 swimmers, fastest 100 swimmers and fastest 400 swimmers. We can see the sprinters (Top 50 PB Group) taking out the race fast, as expected, and then gradually getting slower. They are well ahead of the Top 400 PB Group for the first two 50s, but then much slower for the next 2. The 100 PB Group took it out with the sprinters, but were then able to bring it back faster than the sprinters but slower than the distance swimmers. This is all as expected, and shows that we have some validity in using theses groupings to determine a correlation with the fastest 200 times. I also included a chart of the 50 Offsets, which I’ve found provide a wealth of information. The 50 PB group is able to achieve their high speed in the first 50 with an offset (time above their 50 PB) of roughly 2.3 seconds. The 400 PB group started out more slowly, but had to push hard with an offset of only 1.9 seconds. But this is a 200, and so over the four 50s we can gradually see the differences. The range between the fastest 50 and slowest 50 in the 50 PB group is roughly 2.7 seconds (lowest offset 2.3, highest 5.0). The 400 PB group have a range of only 2.1 seconds (1.9 to 4.0). Again, this is as expected, but interesting, and could be used as a guideline for other swimmers as to how to swim their 200. I included the 100 PB group as they are really a hybrid group. They have a combination of speed and endurance, and we can see their curves are appropriately placed between the other two. For those of you who followed my series about how the elite swim the various 200s, you may recognize the shapes of these curves. The Sprinter Profile involves a fast first 50, and then gradually slowing throughout the race. The Distance Profile involves starting slower, but then coming back with a last 50 faster than the 3rd 50. The Hybrid Curve is somewhere in between. These curves fairly accurately portray how the different groups swim the long axis 200s. Now that we’ve established that the sprinters and distance swimmers race the 200 differently, we can compare the 50 PB and 400 PB groups with the elite swimmers ranked according to their 200 freestyle times. The table below shows the average 200 time of the 8 fastest 200 swimmers as our reference. And then we have the average 200 times of the 8 fastest 50 PB swimmers, and 8 fastest 400 PB swimmers. Basically, the group that gets closest to our reference indicates which attribute dominates the 8 fastest 200 swimmers: sprint or distance. The 400 PB group wins! With a difference in average 200 times of only 0.53 seconds, it’s clearly closer than the 50 PB group with a difference of 0.83 seconds. In other words, distance is more important than sprint for the women’s 200 freestyle. At least at the moment. We’ll follow the same analysis as with the women’s 200 Freestyle. Here are the charts of interest. The first thing we notice is is that all groups swam the last 50 faster than the 3rd 50. This itself is highly indicative that the Sprinter Profile is not being used, which suggests that there are no true sprinters in the group. In fact, we can see that the 50 PB group actually had the slowest average 50 splits for the first three 50s. Even the 400 PB group did each of the first three 50s faster. When we look at the offsets we see more of this. The 50 PB, 100 PB and 400 PB groups all had very similar race profiles, all corresponding to our Distance Profile. In fact the range of slowest 50 to fastest 50 for the Sprinter group (2.2 seconds) is almost identical to the range of the Distance group (2.1 seconds). If nothing else, we can see that almost everyone is swimming this race with a Distance Profile. The table confirms this as well. The average times of the 400 PB group were only 0.23 seconds off the average times of the 8 fastest 200 swimmers. A very small difference. In contrast, the difference for the 50 PB group was 0.77 seconds. So distance is much more important than sprint for the men’s 200 freestyle. By using each of the elite swimmer’s 50 and 400 PBs, we were able to come up with a way to determine the differences between the average 200 times of the 8 fastest 200 swimmers, and the average 200 times of the 8 fastest sprinters, and the average 200 times 8 fastest distance swimmers. These differences showed a slight inclination of the 8 fastest women 200 swimmers towards a distance orientation, and a significant and much larger distance orientation with the men. There were a few swimmers for whom I could not find a 50 or 400 PB, or at least couldn’t find a realistic PB no later than the end of 2012. One of the purposes of the PBs is to rank the 24 elite swimmers into 3 groups of 8 according to different characteristics for the analysis. The other use is with the 50 PBs to allow me to calculate splits as time above their 50 PB (Offset) in order to better deal with swimmers with different 200 times. For problems with a 50 PB, I used their fastest 50 split on a 100 race, and then subtracted 0.5 seconds to account for a foot touch. For problems with a 400 PB, or a realistic 400 PB, I used 4:20.00 (women), and 4:00.00 (men). The assumption is that if the major swimming databases do not have a recent and realistic record of a 400, then they are probably ranked near the bottom of our 24 elite 200 swimmers. The times I gave to them assured that. Reblogged this on Arellanocolomina's Blog.